National Transportation Safety Board investigators examine damage to the engine of the Southwest Airlines plane that made an emergency landing at Philadelphia International Airport in Philadelphia on Tuesday, April 17, 2018. 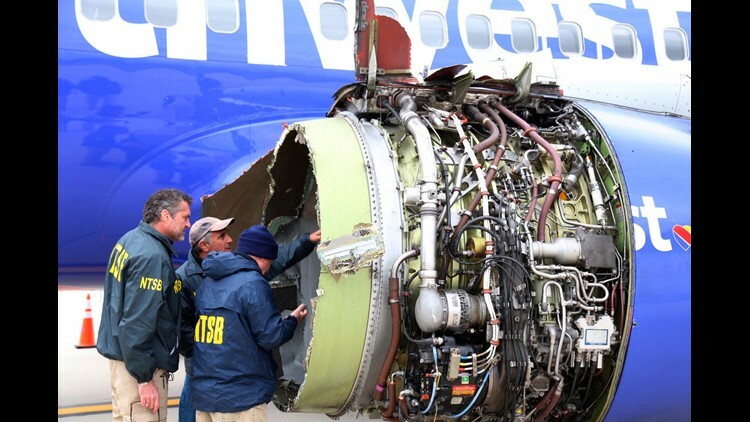 Federal investigators probing the engine failure aboard Southwest Airlines Flight 1380 that killed one passenger are focusing on a broken metal fan that could signal a need for more inspections on the wear and tear of planes. Robert Sumwalt, chairman of the National Transportation Safety Board, said one of the 24 fan blades that push air into the left engine of the 737-700 broke off and is missing. Sumwalt told reporters Wednesday that fatigue cracks were found on the inside of the broken fan blade, but that it was too early to tell whether they might have resulted from a manufacturing flaw. He said the crack was "certainly not detectable from looking at it from the outside." Asked if the problem threatened all 737 aircraft, Sumwalt said that he was unwilling to extrapolate the risks to the entire fleet. The engine and the plane have proven safe and reliable, said Sumwalt, a former airline pilot who flew 737 aircraft for 10 years. "We are very concerned about this particular event. Engine failures like this should not occur, obviously," Sumwalt said. “If we find the need, if we feel that this is a deeper issue, we have the capability to issue urgent safety recommendations." Southwest CEO Gary Kelly told Sumwalt the airline will inspect the engines on all its planes in the next month for fatigue. The airline flies 737 aircraft exclusively, with a fleet of about 700 planes, and all of them have similar GE engines as the one that failed. The engine problem erupted about 20 minutes into the 10:43 a.m. flight from New York's La Guardia airport to Dallas Love Field. Alarms sounded in the cockpit when the engine failed and pilots immediately diverted to Philadelphia, where they took a longer approach than usual and landed at a higher speed because of concerns they didn't have as much control of the plane, Sumwalt said. Airliners are designed to fly on one engine, but pilots immediately try to land in such an emergency because of uncertainties about other problems. "It certainly sounds like they did an excellent job," said Sumwalt, a former airline pilot who flew 737 planes for 10 years. “My hat’s off to them, as a fellow airline pilot." Late Wednesday night, the flight captain, Tammie Jo Shults, and her first officer, Darren Ellisor, released a statement saying they were "simply doing our jobs." "Our hearts are heavy. On behalf of the entire crew, we appreciate the outpouring of support from the public and our coworkers as we all reflect on one family's profound loss," the statement said. "We joined our company today in focused work and interviews with investigators. We are not conducting media interviews." The incident Tuesday led to questions about whether planes and their engines should be inspected more often or more thoroughly. Metal parts of planes show fatigue after numerous flights and begin to crack, microscopically at first and then more visibly. Inspections are designed to monitor wear and tear before they become catastrophic. In July 1996, two passengers were killed and seven more injured when the engine of a Delta Air Lines MD-88 blew apart as the plane sped down the runway in Pensacola, Fla. Pieces of the engine pierced the fuselage and the victims were seated near the engines in the back of the plane. Another Southwest flight from New Orleans to Orlando in August 2016 suffered an engine failure and diverted to Pensacola. There were no injuries on that flight. The engine casing is designed to contain pieces that break inside. But in rare circumstances, pieces spinning at high speeds burst through the shell. A piece of the Southwest engine cowling Tuesday was found on the ground in Bernville, Pa., about 60 miles northwest of Philadelphia, Sumwalt said. "It appears that the containment mechanism needs to be re-evaluated and redesigned," said Ladd Sanger, a commercial pilot and aviation lawyer at Slack Davis Sanger. “When you get to two within a two-year period, as rigorous as the inspection and manufacturing processes are, you’re starting to talk about a pattern developing. It’s not only a pattern of blade failures, but a pattern of uncontained engine failures that shouldn’t happen in the first place." The FAA and the engine maker, CFM International, which is jointly owned by General Electric and Safran Aircraft Engines of France, instructed airlines last year to make ultrasonic inspections of an blades in CFM56-series engines like the one in Tuesday's incident. CFM said in a statement that the CFM56-7B has had “an outstanding safety and reliability record” since its debut in 1997. United Airlines executives told reporters during an earnings call Wednesday that they began inspecting similar engines under an FAA service bulletin last week. Greg Hart, the chief operating officer, said the United fleet has 698 of the engines. The inspections could take the rest of the year, CEO Oscar Munoz said. The NTSB just completed a case in January about an engine disc that broke apart inside the engine of an American Airlines 767 during takeoff at Chicago O'Hare airport in October 2016. The incident hurled pieces of the engine a half-mile away from the plane, but the injuries occurred during the chaotic evacuation. Investigators traced the problem to a manufacturing flaw 30 years earlier that weakened the disc. Investigators will try to determine whether the engine failure represents a threat to other planes. Sumwalt said the investigation has just begun and could take more than a year to complete, but if investigators find problems that require immediate attention, they can issue emergency recommendations.